It's been a while since I posted crochet work, but this one was worth the wait. Yes, this is my favorite yarn, Bernat Blanket Stripes. It comes rolled like a cake in these cool colors - this set is "Tiny Teal." I know I've said this before, but I LOVE this yarn! It is so nice to feel the soft cuddly chenille-feel of this yarn as you work with it. Believe it or not, I just used single crochet, alternating between the front and back loop. I chose to just keep going when the color changed even if it changed in the middle of a row. 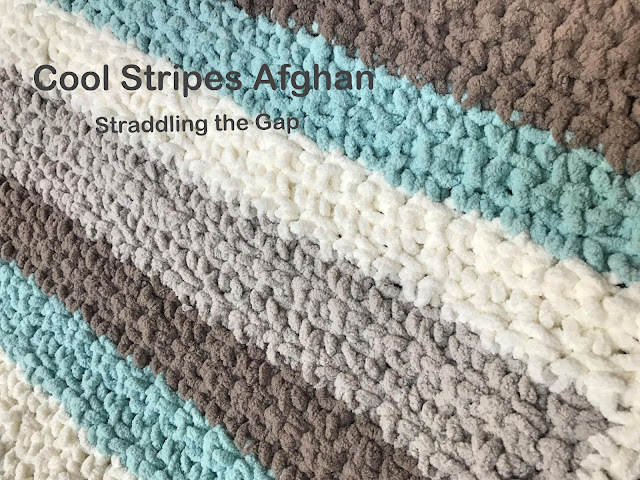 If you would prefer more even stripes, you can cut it at an end before the color changes, but I thought that defeats the purpose of a single skein with multiple colors. 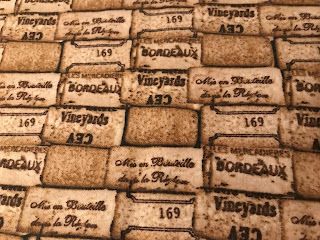 I wanted a blanket that would go with some new pillows I made and be big enough for adult use. This blanket is about 33" x 60", and includes a single crochet border in the cream color. I used just a little less than 4 skeins. Please note this yarn is exclusive to JoAnn Fabrics. It is nice and warm! I'm working on getting some color into my living room and I'm starting to integrate some blue with the red. 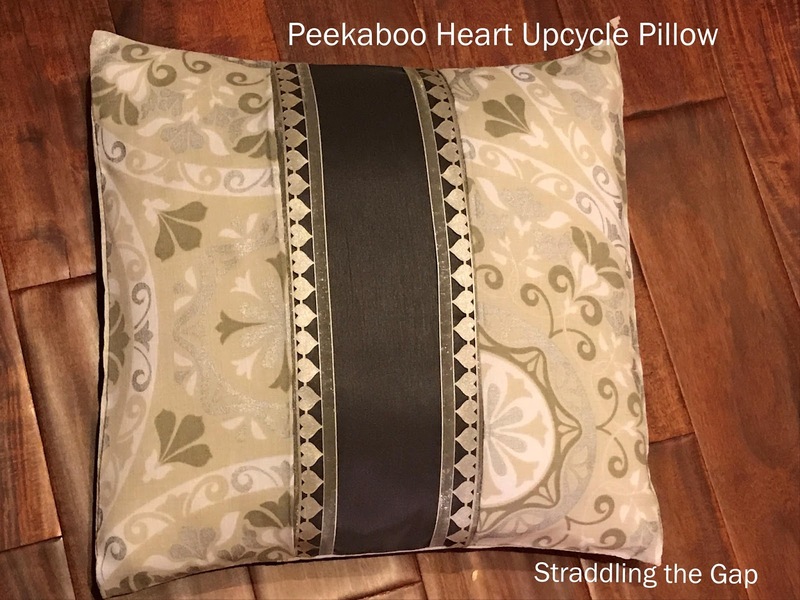 This is probably one of the easiest pillows I will make and I love it combines so many techniques I enjoy - upcycling, rag quilting and pillow making! 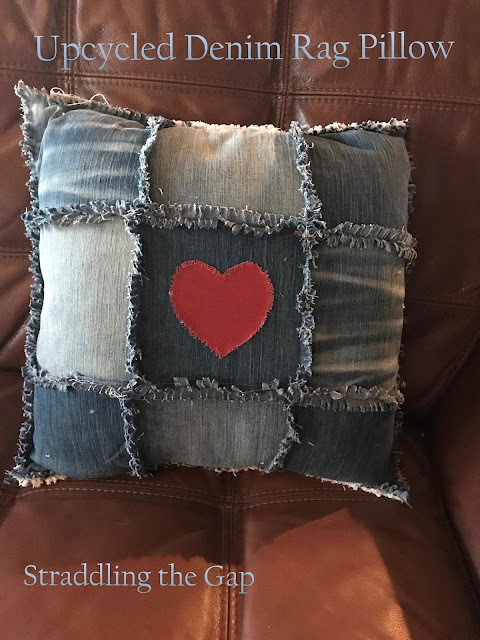 I made a 16x16" pillow (front only) using a single pair of 30 x 32" blue jeans that belonged to my son. I was able to recycle enough denim to make 2 pillow fronts. First, I cut all of the seams off the fabric. 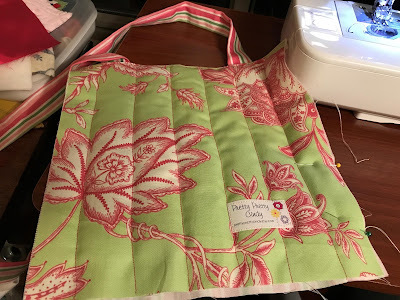 You can use seams, but for this project I just wanted the raw fabric. I cut 9 6x6" squares and arranged them so I mixed the color hues. Constructing the denim side of this pillow was a little like constructing a rag quilt top. Start by matching the squares on the sides, WRONG sides together. This is different than you normally sew seams, but these are ragged seams. Sew three rows of three squares each, side by side, using a 1/2" to 5/8" seam allowance. 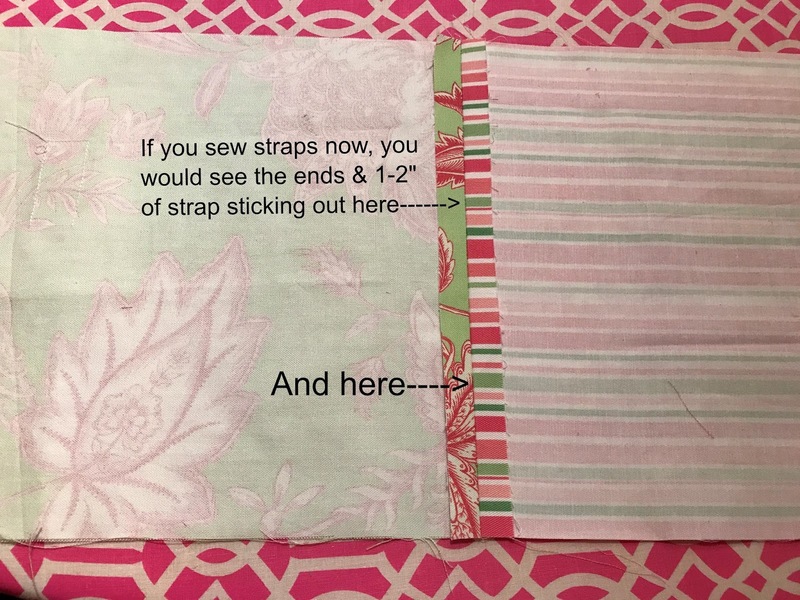 After you get the three rows created, you can care fully pin them, WRONG sides together, and sew the horizontal seams. When sewing over the vertical seams you already made, it's fine to push the seams to one side or another and sew over them. You are going to "rag" them anyway. The important thing is to get the horizontal rows lined up correctly. Create the heart with a 5x5" piece of red fabric. I cut all my hearts free-hand by folding the fabric in half horizontally. 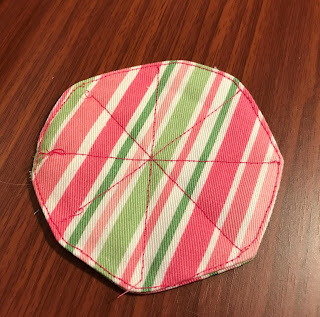 Holding the fold in your left hand and starting at the bottom, cut around the folded square in a half-heart pattern. Here's a couple of pictures of the technique from another project. 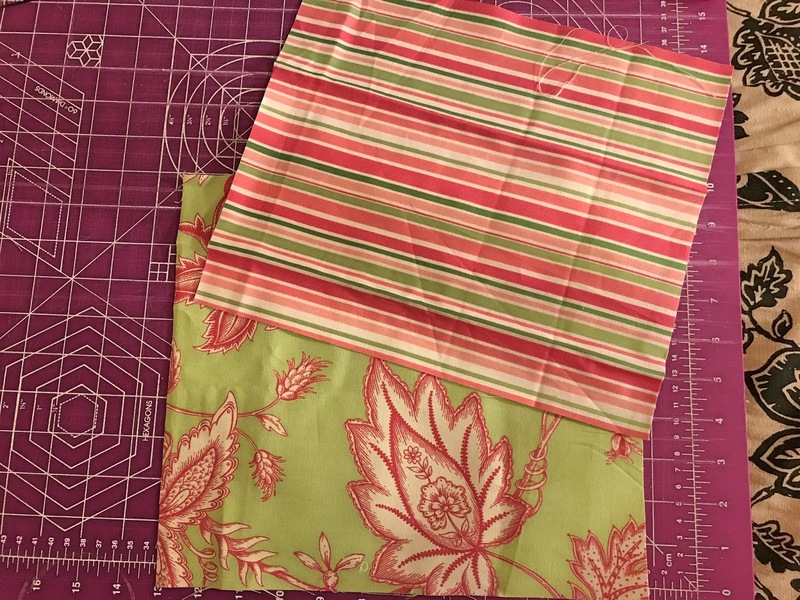 The first picture shows the cut starting from the bottom center point with the fold on the left, and the second picture shows the same fabric flipped so the fold is on the top right as the heart is cut out. Here is the one I cut for the pillow. I used a disappearing fabric marker to trace about a 1/2" inside the heart and then pinned it to the center square. I followed the line in sewing the heart to the denim square so I can also rag the heart itself. Now you're ready to make the back of the pillow. I used some plain utility canvas and cut 2 12" x 16" pieces. (Be sure to wash canvas fabric before cutting it so if it shrinks, it won't mess up your finished product.) I turned under hems on one of the 16" sides on each of the fabrics - one on the right side of the fabric and the other on the left. 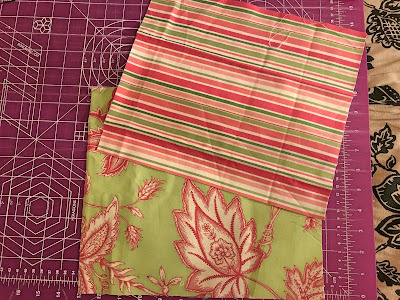 I only turn under about 2" total on each hem, so when you match these with the front cover, there will be about a 4" overlap where the pillow can be inserted. See my tutorial on making envelope pillows for a better description of sewing the back of an envelope pillow. I used a decorative stitch in a red contrasting thread. Once you are done with the back pieces, pin them to the front cover with the WRONG sides facing. You are going to make ragged edges around the pillow. Sew all the way around the pillow, attaching the front to the back. This is what the front will look like after all the seams are in place. 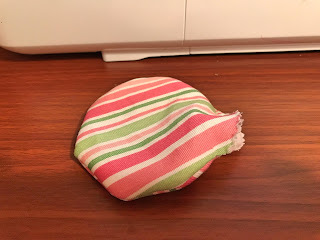 Run the pillowcase through the wash to get the rag effect really going. Then insert your pillow form in the back. 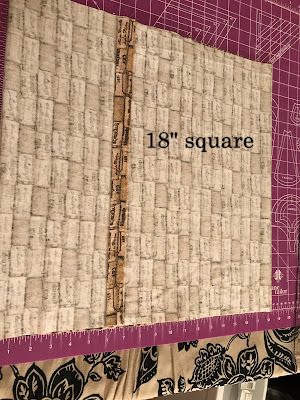 12" square pillow = 12" x 30"
14" square pillow = 14" x 30"
16" square pillow = 16" x 40"
18" square pillow = 18" x 45"
20" square pillow = 20" x 50"
22" square pillow = 22" x 55"
24" square pillow = 24" x 60"
I have worked a lot with snuggle flannel, but never on making pillows. I am now a huge fan. It's soft, very easy to work with and looks great. Her pillows were 18" square, so I cut the fabric into 18" x 45" pieces (I made 4 identical pillows). 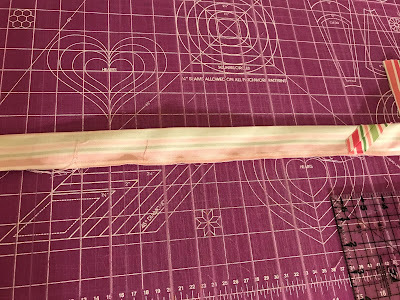 On each 18" end, turn the fabric under 1" using a 5/8" seam. I like to use a zig-zag stitch or other decorative stitch. 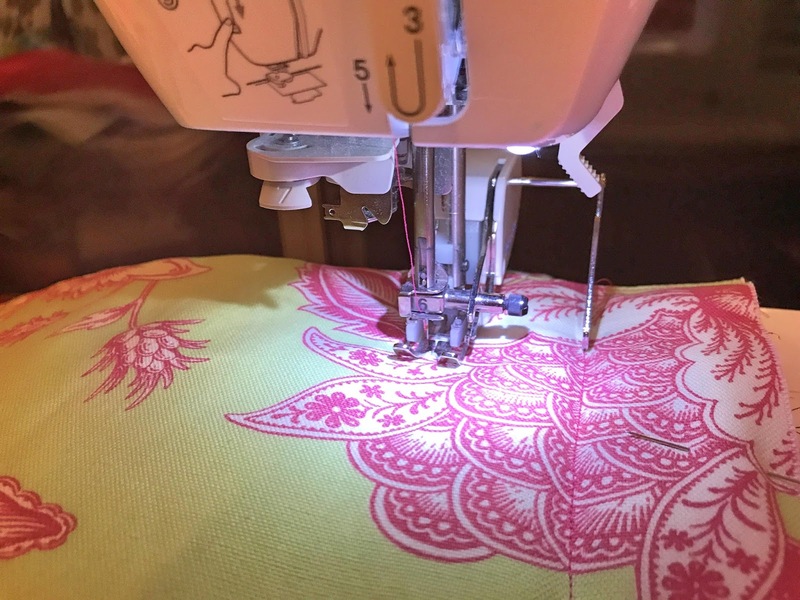 Depending on the color of your thread, one of the seams will show on your finished pillow, so it's nice to make it look attractive. Lay the piece of fabric, right side up, long side horizontal. Fold each side back toward the middle, and overlap the ends so only one seam shows. 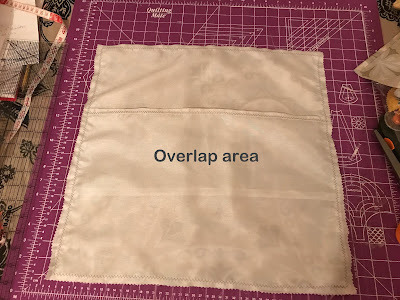 Overlap the fabrics until your fabric is 18" square. Pin the two raw ends (top and bottom in this picture). 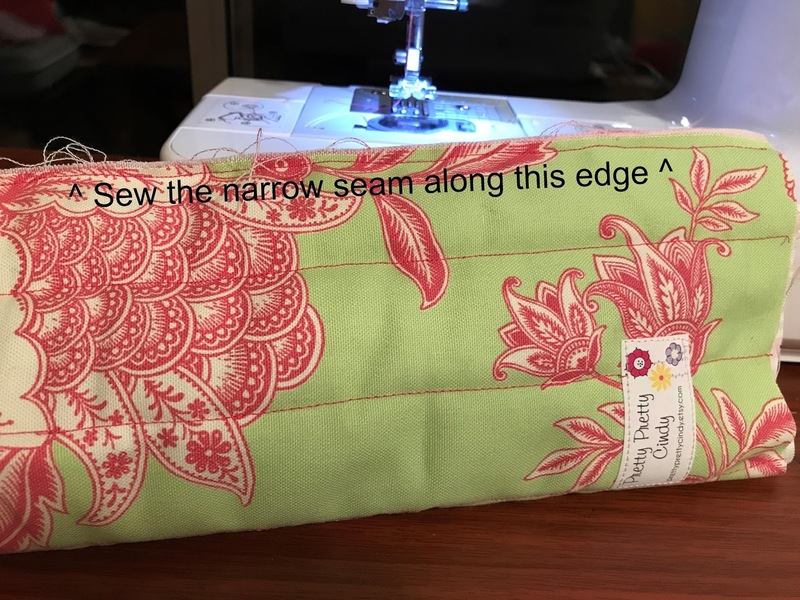 Sew those sides using a 5/8" seam. At this point, because I was using flannel, I trimmed the seam allowances using pinking shears so it wouldn't fray. Turn the pillow cover right side out. 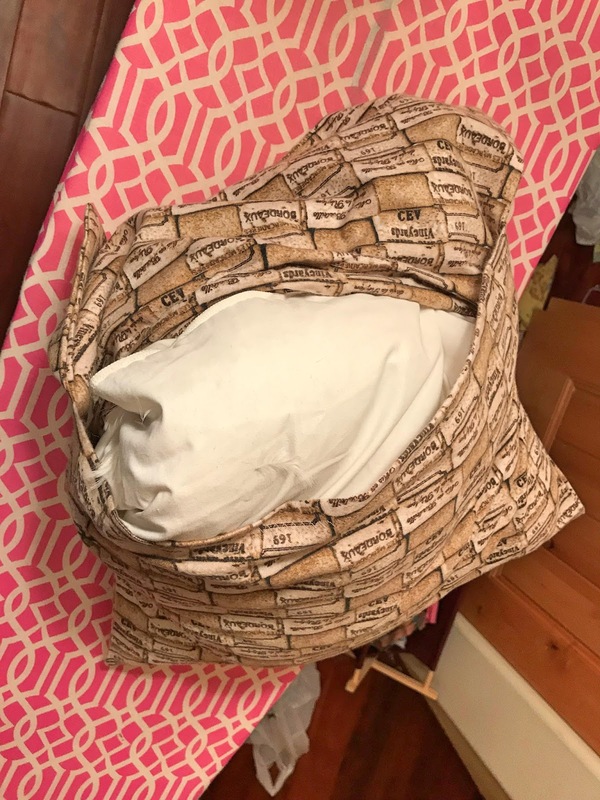 Insert the pillow form, pushing it into the corners and then pushing into the bottom half. And that's it! 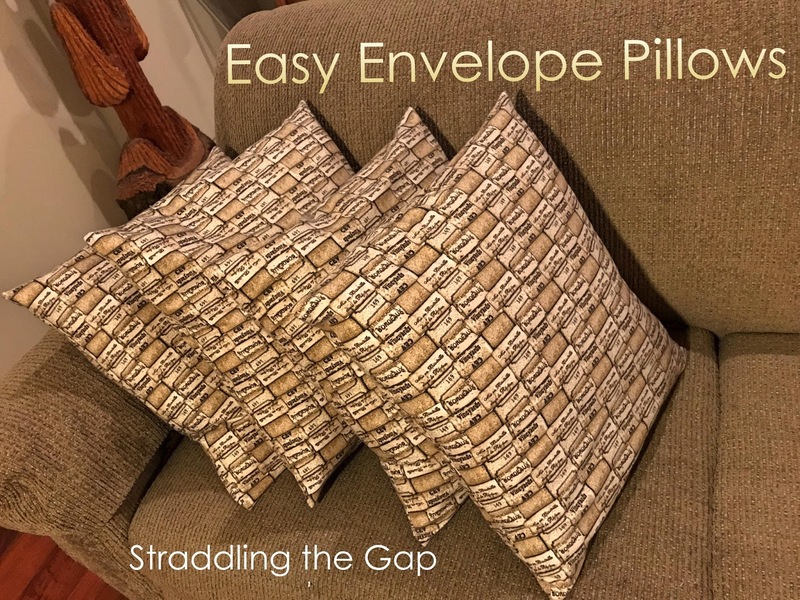 Envelope pillow covers are my preferred method of sewing pillows because you can easily change the pillow covers for a new look or season, or just to clean. 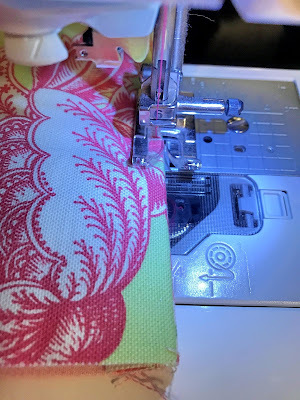 Knowing how to sew means you can create those little items you can use everyday out of fabric you like and in sizes that work best for you. Here is another one of those little items that I learned to make and now I can whip one up in a half hour or so (which is great if you lose water bottles like I do). This same idea can work with a lot of sizes of bottles and have shorter straps for kids. This bottle carrier will hold many standard size manufactured bottles, but if you want one to fit a specific bottle, you can alter the pattern by using the circumference of the bottom of the bottle and its height as a guide. Here is the pattern I used to make mine. I borrowed heavily from this pattern from ilovefabric.com. 1 piece of batting 10.5" x 9.5"
The 2 main pieces of fabric can be the same design or if you want to have a coordinating fabric as a liner, you can use 2 different fabric designs (which is what I did on this bottle carrier). 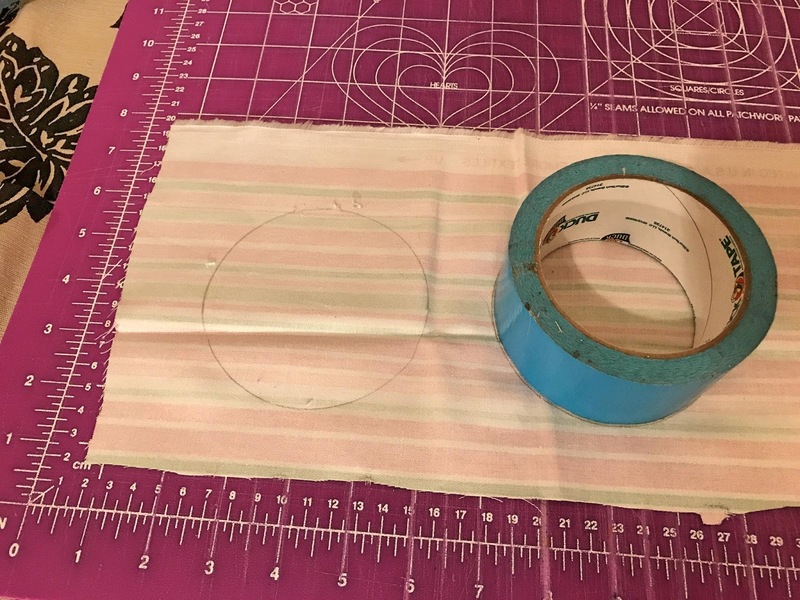 As a cheat, you can use a roll of duct tape or other circle to get that circle pattern. You can use twill tape or heavy ribbon for the strap. I chose to use the coordinating fabric because I think the straps hold up better. If your strap fabric isn't 50" long, don't worry - here's how to piece strips. 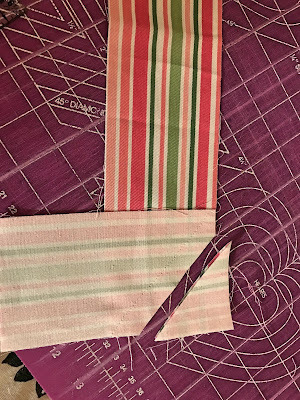 Take two pieces of fabric and lay them perpendicular with right sides together. 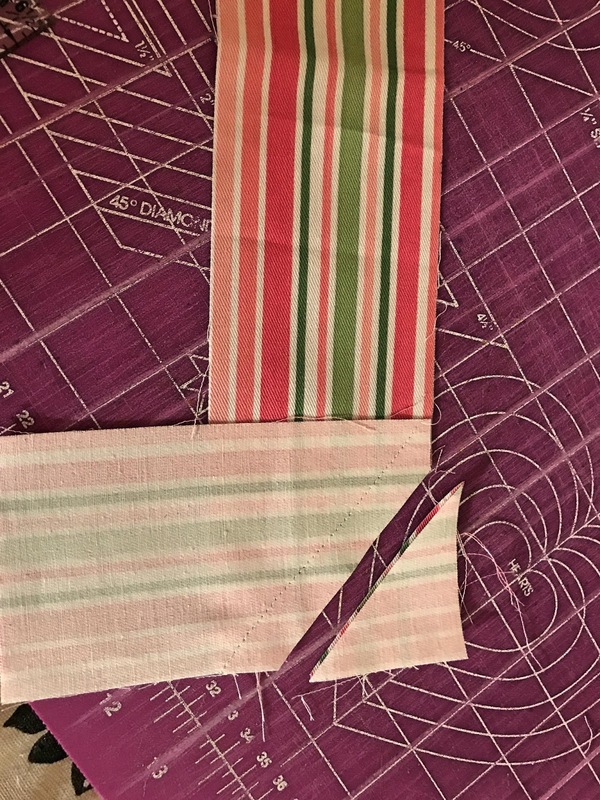 Sew a line diagonal across the area where the pieces intersect and then cut the selvage. 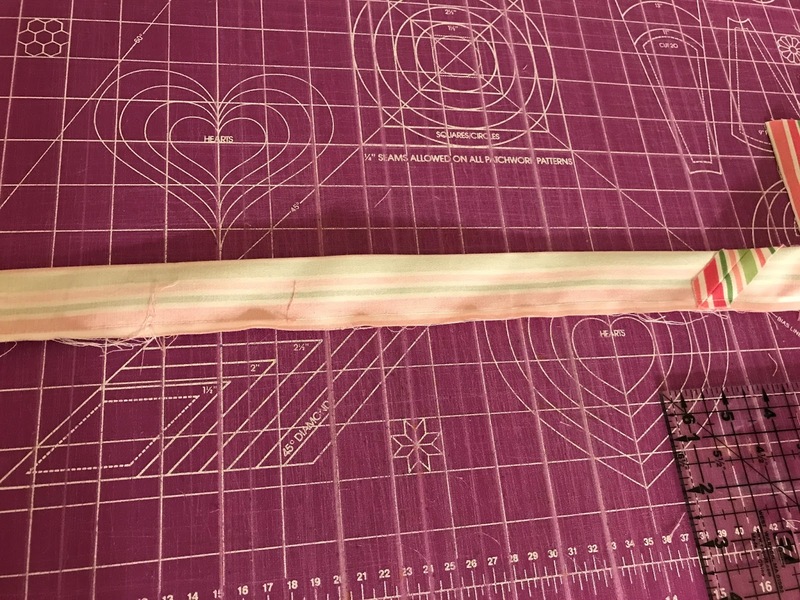 Taking your new 50" strip, sew the ends under and then fold the long side in half, right sides of fabric facing each other. Sew a seam with a 1/4" seam allowance from end to end, leaving the ends open on either end of the strap. Using a safety pin attached to one end of the strap as a guide, turn the inside of the strap out so the right side of the fabric is showing. Iron the seam. At this point you can topstitch the lengths of the strap if you wish. That gives the strap a flat look. Pin the batting to the wrong side of the outer fabric. 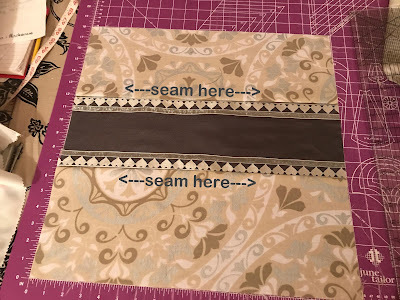 This will hold it temporarily as you get started on quilting. If you didn't already sew the straps onto the fabric, sew them onto the right side of the lining fabric, about 1-2" from the edges. 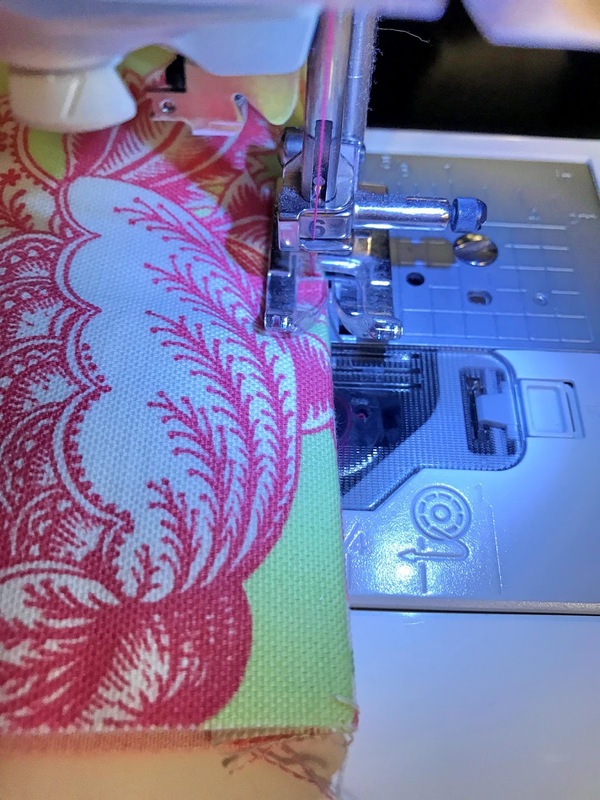 Be sure you are only sewing onto the lining fabric so the seams don't show through on the outer fabric. Fold the lining fabric over the batting so the right side of the liner fabric is showing. Topstitch along the top, right next to the seam you sewed to join the outer and inner fabrics. Gently insert the circle batting into the opening. Hand sew the opening closed and then sew the circle with seams like a pie - 4 seams in all. Take the main bottle piece and fold it in half WRONG sides together. 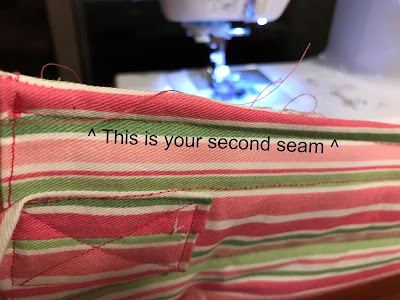 You will use a French seam to make the circular shape, and that is a two-step process. First sew a narrow (1/4") seam along the raw edges to join the sides. 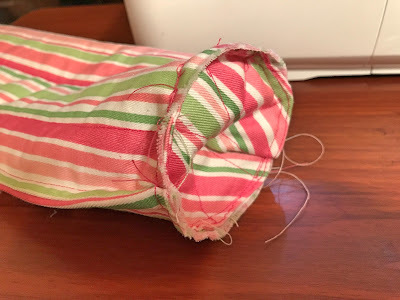 Now turn the tube inside out and sew another seam on the same edge, this time using a 5/8" seam allowance. That will have the effect of "capturing" the first seam in a way that looks really clean. Now you're ready for the hardest part - sewing the circular bottom on the open end of the tube. Carefully pin the circle onto the bottom of the inside-out tube (striped side in the pictures). Slowly sew it onto the bottom of the tube. 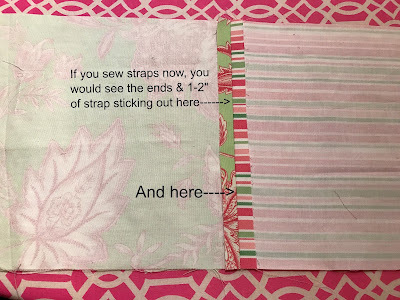 You can also hand sew it on if that is easier for you. This is what it looks like when it's done. It's not pretty, but it's the inside of the bottle carrier. 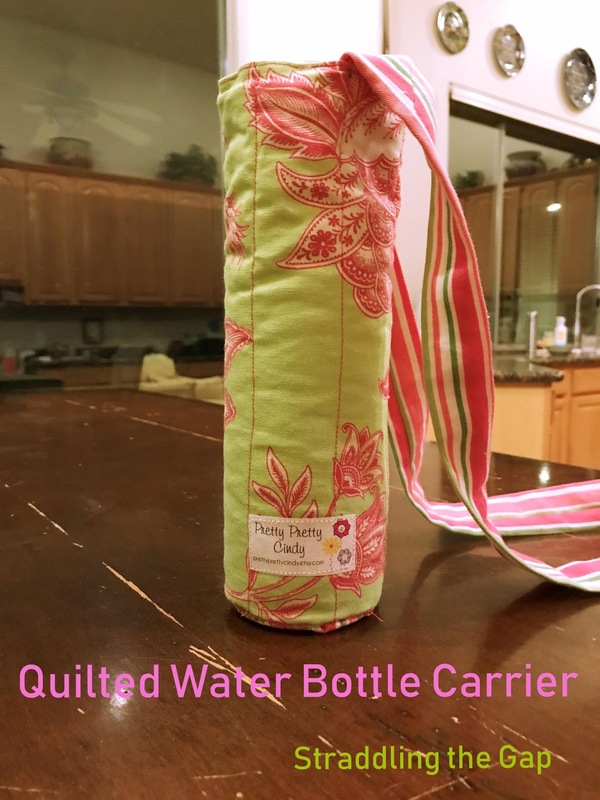 Turn your bottle carrier inside out and you're done! Last week I talked about the haul I bought at Goodwill on a half-price Saturday. This is one of the pillows I made. I call it the "Peekaboo Heart" because the grey fabric in the center is "peeking" out from under the heart ribbon and the two side fabrics. I found the idea from this pin on Pinterest from France. However, because I don't read French and I don't recall seeing a pattern, I came up with my own. 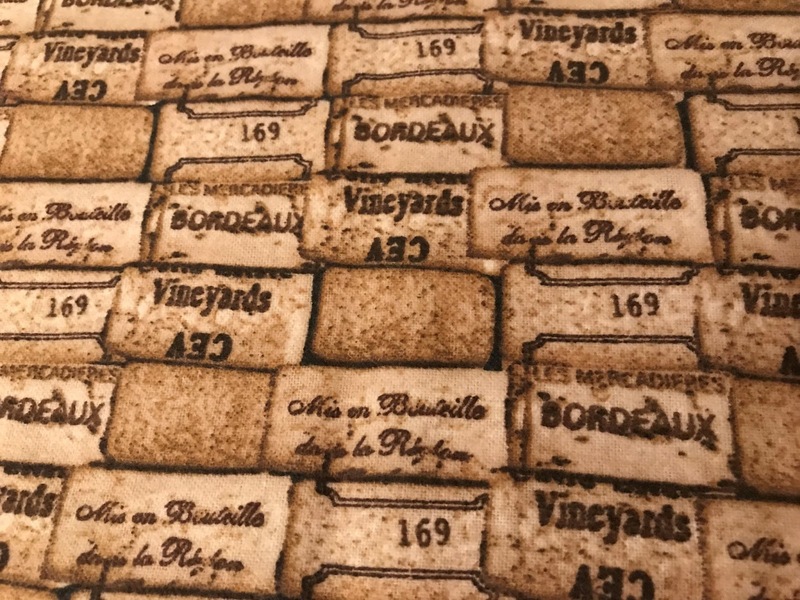 I started out with this fabric I found at Goodwill. While I bought it as a piece of fabric, it might have been a curtain someone cut up before donating it. I also had a couple of fabrics I upcycled - a steel grey valance and cream curtains - both from my bedroom set. These made the center piece on the front, as well as the back of the pillow. Finally, I've had this pretty ribbon for a long time, probably because it is so wide and with the hearts, it's not easy to tie. Main Fabric "A" 2 pieces 7" x 18"
Contrasting center Fabric "B" 6" x 18"
2 pieces Fabric "C" 13.5" x 18"
I like to make envelope pillows because I can easily remove the cover from the pillow and wash it. In this case, based on the fabrics I used, this will certainly be a dry clean only pillow cover. If you noticed, I also like pillow covers to fit more snugly. 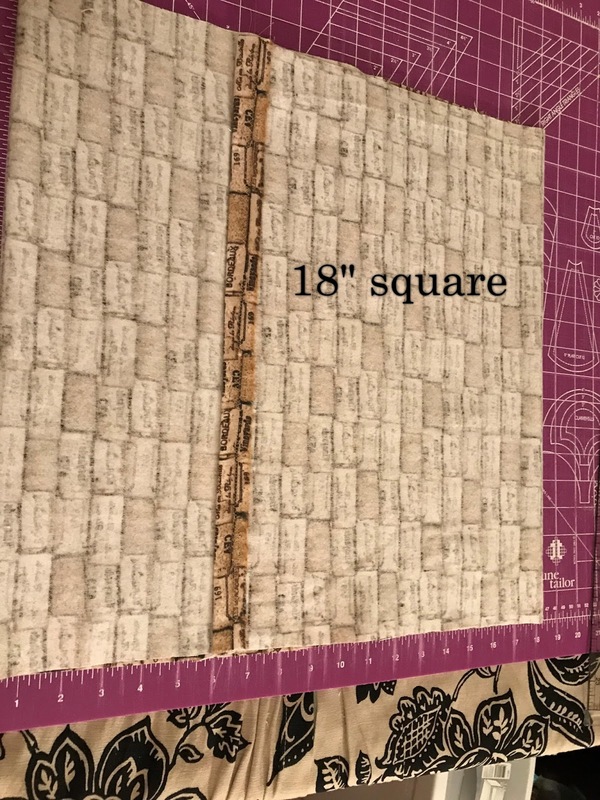 That means that if I am making a pillow cover for an 18 x 18" pillow, my fabrics will generally add up on the front and back to 18" square (no extra fabric for seam allowance). 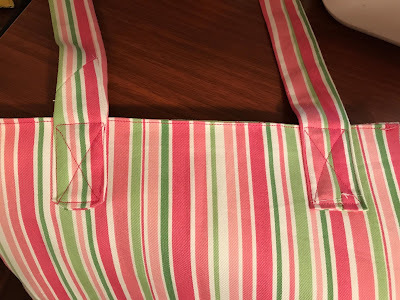 Because these fabrics are all dry clean acetate type fabrics, I used a needle for fine fabrics and zigzag stitches to prevent puckering and fraying on the seam allowances. I also cut them with a pinking shears. You might consider putting the zigzag in before you even start using the fabric if the risk of fraying or running is high. You can also serge it for a finished look. 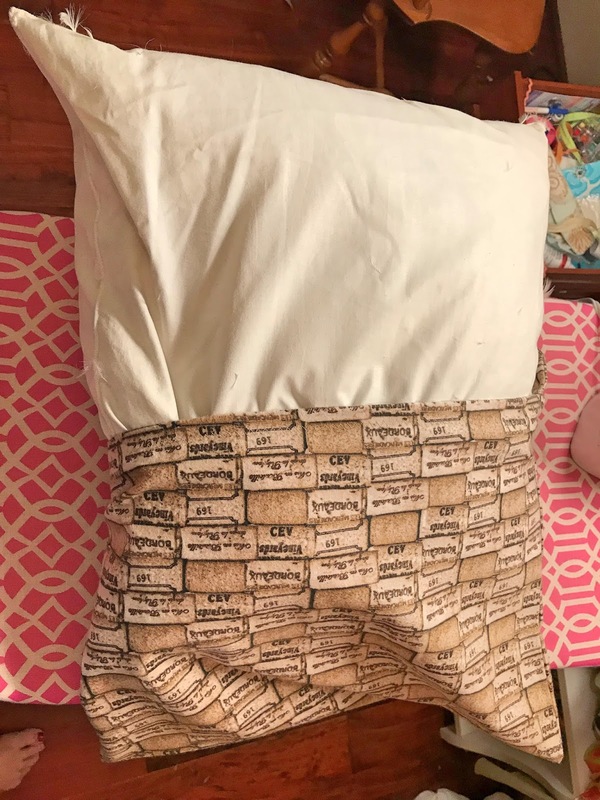 For the back of the pillow, I cut up one of the curtains that came with my bedroom set. Like the valance, the curtains didn't fit my window, so they made great fabric for a fancy back. On each piece of fabric, I turned under one of the 18" sides by folding over 1/2" and then folding over another inch again to make a hem. Using a zigzag stitch in a contrasting grey thread, I sewed over the top of the fold to make a hem. When you're done with this step, you should have two pieces of Fabric "C" each with one of its 18" sides sewed under in a hem. 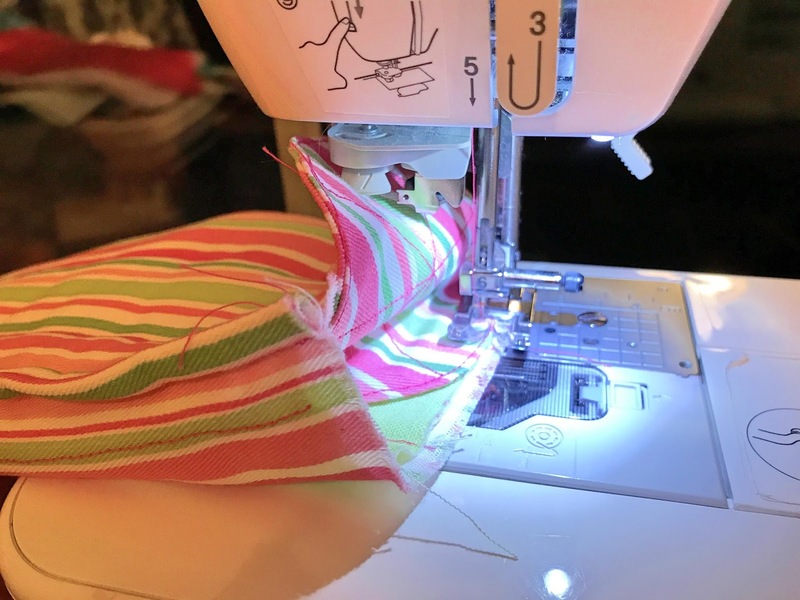 Using a zigzag stitch, sew a 1/4" seam all the way around. Clip the corners and turn right side out. Ease the pillow form into the finished cover, taking care to push the form all the way into the corners. You're done! I'm in a real pillow-making mood, so watch for more designs. 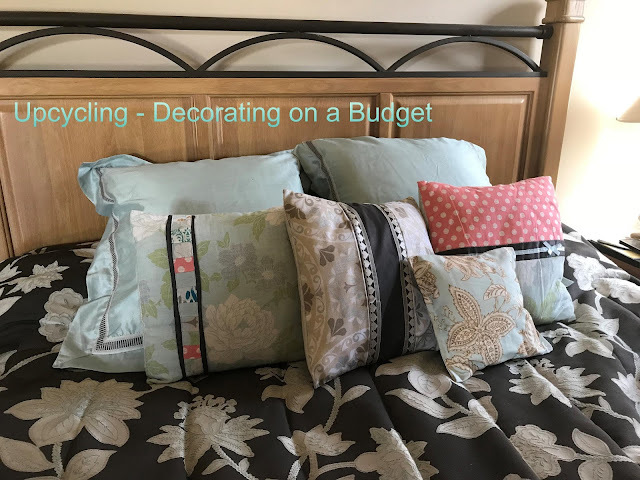 Upcycling Goodwill Challenge - Pillows! I have been in a serious pillow-making mood lately. 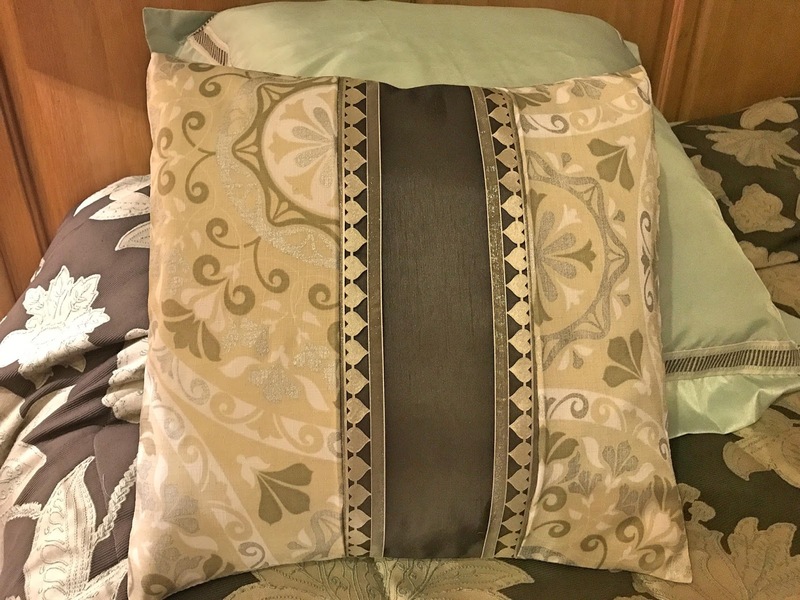 I have a pillow obsession going on my Pinterest page - check it out. 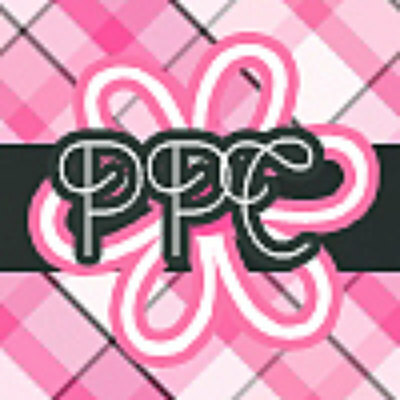 While I don't sell pillows or pillow covers in my Etsy store, Pretty Pretty Cindy, I might someday. 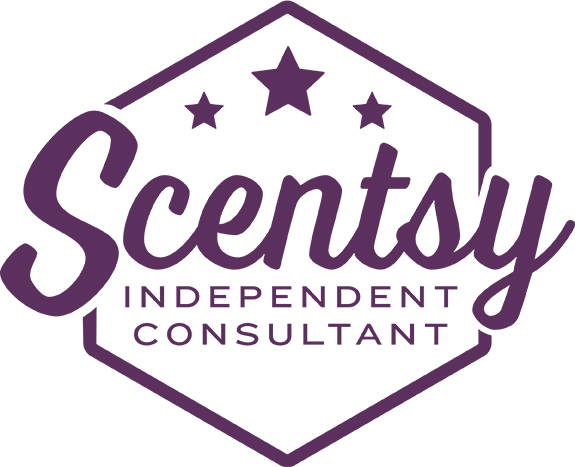 I am starting to sell on Sundays on my Instagram Pretty Pretty Cindy account, so follow me there. In the meantime, I need some pillows at my house! I have been working on our master bedroom for a while and wanted to work in some pillows on our blue/green-gray bedding. The bedding set came with two European shams, but I wanted throw pillows for color too. But have you seen the prices of home decorating fabric, and worse yet, pillow forms? My pillow fetish could easily break the bank. Goodwill to the rescue! For the two big pillows in the back I used the forms from the Goodwill pillows and the shams that came with the bedding. Buying ONE pillow form alone in a 26x26" size could cost more than $22. I made the pillow covers on the other four pillows. Two of the pillows came from forms I bought at Goodwill and the fabric mostly came from Goodwill. I didn't buy any new fabric or trim for these pillows. Isn't that awesome? These are also all "envelope" style pillow covers, so I can remove them to dry clean or just change for a different design. I'll post how I made these pillows, but I will admit that I shamelessly copied designs I found on Pinterest. The best part - this isn't even using the whole Goodwill haul! I still have other pillows and was able to recycle some of fabric from the Goodwill pillow covers. Upcycle!